As one requires a door to get in and out of a house, an artillery fort required a gate - or two. But not too many. A fortification was definitely a place where one wished to control access and quickly restrict when necessary. In order to hold back the wall of the fort to the left and right, and to hold up the gate itself, a sturdy frame was required. For cheap and quick, engineers could make do with wood. But even in an earthen fort, the gate was the spot to indulge in some masonry. It provided the strength required and looked muscular, too - and was not inflammable. Since the gate was seen by all entering, the construction was often especially well done, with arches and ornamentation. After all, one wished to make a good and "strong" impression. The doors to the gate were not usually at the outer end. They were set back within the gate to shield them from bombardment. The doors could be solid, heavy wood perhaps reinforced with iron, or they could be iron grates. One set of doors was good but two were better. One combination was iron grate doors toward the outside and solid doors farther inside the gate. Some forts sported gates with more than one entrance. There was a large one for passage of wagons, carts and those on horseback. To the side was a smaller, shorter opening for pedestrians. To achieve a classical balance, three entrances were also employed, two short ones for pedestrians, one on each side of the larger, grander one. The fort at Lucca has such a gate, resolute in all its Renaissance magnificence. 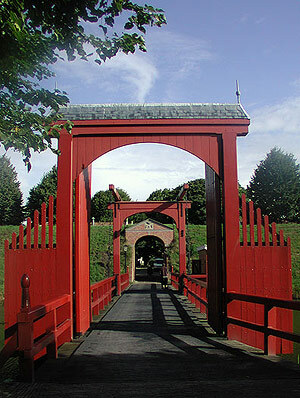 The south gate of Bourtange seen through the open drawbridge. Click to "get closer" to the gate, then double click to return to the original view. 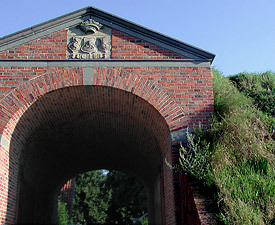 The Dutch earth fort restored at Bourtange has two simpler, one-entrance gates, set as opposite each other in the ground plan as any engineer could with a pentagon. But as functional as these gates are, they still have an ornamenting crest to proclaim who is in control here. Out from the gate and crossing the ditch was the bridge. Many forts used drawbridges - but they were usually not what Hollywood would have you envision, as we'll see in the next chapter: Beyond the Fort.